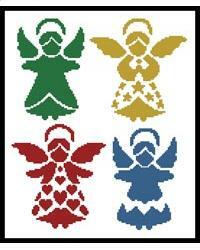 This counted cross stitch pattern of cute, little, easy to stitch, Angels was created from beautiful Artwork copyright of Joni Prittie. 121w x 146h total, each design is approx 65w x 75h. Only full cross stitches are used in this pattern. It is a black and white symbol pattern.